Reviewing Radon- Is Your Rivercrest Home at Risk? Radon is a gas that cannot be seen or smelled. Radon is formed when uranium naturally breaks down from within radioactive contaminated soil. Radon can be found in high concentrations in rock and soil that contains granite, shale, phosphate and uranium, and in fill soil containing industrial waste. When Radon Gas moves through the soil and is released into the outdoors, it safely evaporates into the open air. However, when Radon seeps into buildings through cracks in the foundation, the water supply, or other avenues, it can become harmful to the building’s occupants. How Do I Find Out My Home’s Radon Level? Although radon kits may be purchased at various retailers, it is generally recommended that Radon Testing be performed by a qualified radon specialist (especially when being done as a part of a real estate transaction). What Do I Do About My Loudoun County Home’s High Radon Level? There is no level of Radon that has been deemed “safe,” however, the EPA (Environmental Protection Agency) considers an exposure level of 4 (or more) picocuries per liter (pCi/L) to be a dangerous level, requiring remediation. Methods for lowering radon levels include ventilation systems, pressurization of the basement air, block wall ventilation, and, the most commonly used and effective method, sub-slab suction. The sub-slab suction method requires the installation of plastic piping through the floor slab of a house, basement, or crawlspace, and utilizes a low-volume, continuously operating fan to create a negative-pressure within the piping to draw in radon-laden air from below the house and vent it harmlessly to the exterior. 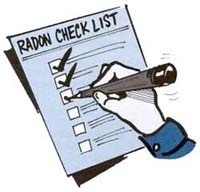 Be sure to contact a professional to assist with your radon concerns. Ask Gina & Company, with Keller Williams Loudoun Gateway, would like to thank House Master for relaying this information. As always, please call Ask Gina & Company at (703)574-3478 with any and all of your real estate quandaries.